John Balance: You sort of utilize the chaos that we propagate and generate chaos. Not in a sort of punk-anarchy kind of way, but mental chaos. As we were saying before, we believe states of delirium and sort of self-induced madness, whether it be from LSD or schizophrenia, which you would, you know, invoke and make worse. I actually believe that you can strengthen yourself through those things by putting yourself through it…If anyone wanted to look for a message in our music, you know, in our overall sort of thing, it would be that you just have to go through individual visions, whether they be Hitler or Bosch, you know, Breughel, or something, but it’s only by plowing into yourself that I think you can get anything worthwhile. Turning away from outside influences, you spend so much energy shutting out and filtering everything, you know, records and TV and that…I can’t actually listen to the radio. It makes me physically ill…In a sense, we’re being tarred by our own brush in this condemnation, but, you know, try to have that, and have the ability and have the, the time to work in isolation, you know? Get on with what we really believe in…This is the first time we’ve stood in front of a video camera and said these things. We’ve had numerous opportunities to play huge festivals in Holland and in America. We’ve been offered to play the Palladium, which is like the biggest night club there, at the moment. We just say no; we get this perverse pleasure in turning these things down in a way. But we don’t, we don’t want to dilute what we think we have, by, sort of, either compromising it in a live situation, or becoming just another little marker in the marketplace, you know? Three years before this interview, Coil played four live shows, most of them in conjunction with Zos Kia, and before that, John Balance and Peter “Sleazy” Christopherson played live in Psychic TV, but for the next thirteen years after this interview, Coil would not grace a live stage again. That is, until John Balance met a veteran keyboardist who played with Julian Cope and Spiritualized, Thighpaulsandra. 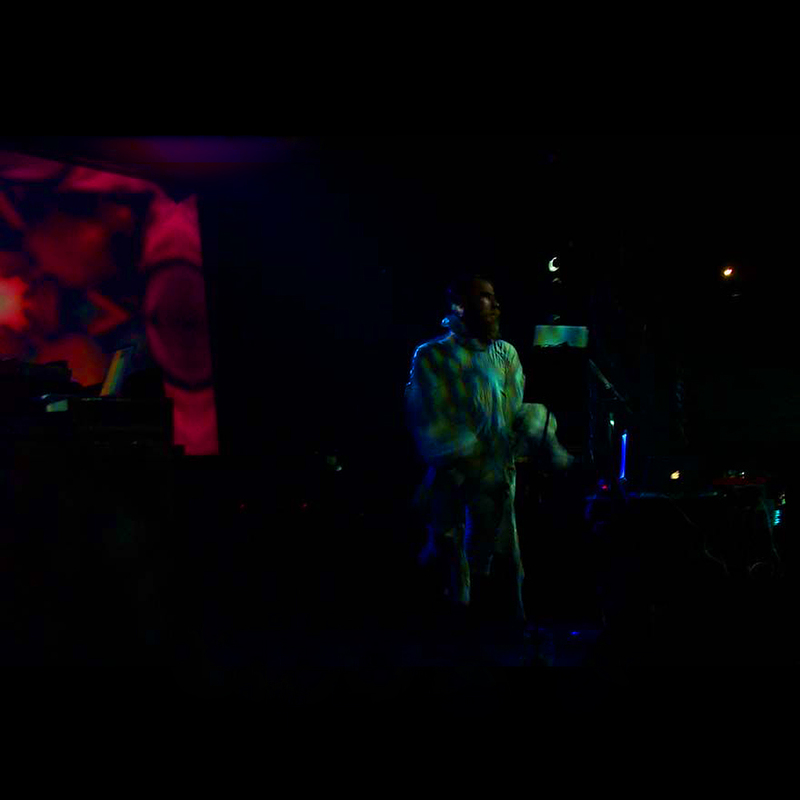 Of course, Coil took all their other ideologies to heart when they did finally play live again… and the result? The best music I have ever heard in my life. It’s May 2013. John Balance has been dead for almost 10 years, and Peter “Sleazy” Christopherson for 3. I am not a major fan of industrial, electronic (except for Kraftwerk), or experimental music, but I am a fan of The Velvet Underground and some of the early drone/avant garde acts associated/contemporaneous with the band. One day, I am looking through Angus Maclise’s (the original drummer for VU, before Maureen Tucker) Wikipedia page. I’ve heard snippets of his work, mostly The Invasion of Thunderbolt Pagoda, and was curious to learn more about him. Under the “Influence” section of his page, I discovered that though most of his work remains unreleased, a band called Coil cited him as one of their biggest influences, going so far as to recite his poetry in some of their songs. This was very unlike me at the time, for I often do not seek out new music and instead prefer to listen to EVERYTHING I can by any given artist that I happen to enjoy – by this point, the only band I had truly done this with is Joy Division, as they were my favorite band at the time, where I went so far as to listen to every live bootleg/demo/rehearsal I could, but other bands like The Velvet Underground, Nirvana, Momus, Can, Daniel Johnston, and New Order have received similar treatment since – but I just decide, “What the hell?” and look into Coil. Their basic synopsis on Wikipedia sounds appealing enough, so I check out the first song off their first LP, “Ubu Noir” off of 1984’s Scatology. Admittedly, I am quite confused, yet heavily intrigued – one can definitely hear Maclise, Lamonte Young, etc. in there. Over the next few days, bit by bit, I check out more and more – “Tattooed Man” off of 2005’s The Ape of Naples, “Ostia” off of 1987’s Horse Rotorvator – and soon came to be a fan. Those two albums especially really hit it off for me, and I still consider them my co-favorites by Coil to date. Along with the aforementioned studio songs, I also remember the first live song I ever saw of them: “I Don’t Want to Be the One,” off of Colour Sound Oblivion DVD #7, and my God, what a performance to start with! I knew nothing of their live history at the time, and though I wasn’t exactly a prude at 16-years-old, it was certainly a shock to see two naked gray men spit blood all over themselves while the most high-pitched screeching song I had ever heard before played over a lunatic shouting “I don’t want to be the one!” at the top of his lungs. It was a jump directly into an ice-cold pool, and one that I can’t get over to this day. Again, this was May 2013. It was not easy being a fan of Coil by this point, and in many respects, it continues to not be easy. The “party” has long since been over, for obvious reasons. None of my friends nor family had ever heard of Coil, and as of May 2017, most of their albums remain out-of-print, with the exception of the recent reissues via Coldspring. I occasionally splurged on a CD later on, but I was mostly dependent on (*cough not so legal cough*) downloads and Youtube. As I heard more and more, I began to feel closer and closer to John and Peter, and only grew more and more devastated that I will never, ever be able to tell them just how precious they were as people and how much their music has changed my artistic sensibilities and life for the better. So, the mission ever since then has been to pick up as many pieces that are left as I can and try to preserve them all as best I can. Thankfully, this has not been as much of a fool’s errand as one might initially think. I still remember seeing the live version of “Going Up” for the first time, then seeking out the studio version right after and being so moved by both of them. Such discoveries continued that way for a time, until I heard and understood exactly what 2010’s Colour Sound Oblivion really was. Back then, it was pretty much the only explicitly available source of Coil live anywhere – most of the other blips you could find were just lower-quality versions of the same material, either on VHS or Youtube. At first, I only listened to the set, as there were links on Brainwashed to archive.org where MP3s of the DVD audio were all available, but even back then, it was clear to me that I found their live material to be the absolute best music Coil had ever produced. It took me a while – I remember feeling so depressed over there only being three live versions of “Ostia,” which is my favorite studio Coil recording and, depending on the version, one of my favorite live songs of theirs as well – but once I discovered several apocryphal live recordings on archive.org, I instantly became a happy collector, just as I had become with Joy Division. Also around this time, I joined the main Coil fan group on Facebook and later two others. It’s been a wonderful community. Without them, I would have been utterly dejected and lost, struggling to find any sort of kinship with other people under Coil. That tradeoff is well-worth the odd spat among members every now and then. Within this community, I have actually been able to speak to former Coil members and affiliates, receiving quite the education of Coil’s history in the process, along with having the fun geek-out conversations with other fans, and I am eternally grateful for all that. As life carried on, I sought more live recordings, rightly assuming that what was already out in the ether wasn’t even close to the end of it. It took me a while, but eventually, I listened to all the available ones, and by this point, I’ve heard them all several times over – to me, they’re just that good – and of course, I craved more. However, some remaining Coil affiliates side more with John and Peter on the issue of sharing more music. The two of them were not necessarily perfectionists, but they were adamant about releasing only the best material and keeping everything else behind closed doors, which is why Colour Sound Oblivion included only 14 shows and was intended to cap off any official future Coil releases forever after. As I’m sure you can tell, I understand and respect this perspective, but I still disagree with it. I fully admit I am a completionist, and part of that comes with the realization that preservation is the absolute key to Coil’s legacy. Subjectively speaking, some people may always prefer the other, unused stuff over the officially released material, and with preservation and availability, future generations will be able to discover Coil and fall in love with the music just as I did. Around 2014, I shared these opinions with Ben S. regarding the preservation of Coil’s music and the two of us embarked on uncovering as many recordings as possible and posting them all onto archive.org. He and I have made great strides in that regard and I am very proud of the two of us, to say nothing of everyone else who decided themselves to post whatever recordings they had up additionally, of course. Over time, it’s become clear that many of the fans and affiliates alike have started thinking this way – September-November 2016 were great months to be live Coil fans/preservers, thanks to Massimo and Pierce releasing their archives out into the world. Having spoken to a few other gentlemen, it’s clear there’s still so much more left to be discovered, and we may have more to look forward to as time goes on. As time has gone on and I have been adding to the document, I figured there was a better way to get the information out there. I considered self-publishing the information as a book, but ultimately decided against that. In the summer of 2017, I approached my friends Phil Barrington and Stefan Beiersmann about the possibly of making a website. I had and have no experience in this endeavor but knew that they did and wondered if they would help me. They most certainly did. Stefan donated the website space and Phil designed the website, organizing my information. I cannot thank them enough for doing this – they made it possible and I am eternally grateful to them both! Thus, Live Coil Archive, while probably FAR more comprehensive than you might expect and/or believe to be necessary, is a continually evolving beast. The information gathered therein has been a labor of love for a few years now and I intend to keep it going. Credits and thanks go to Thighpaulsandra, Massimo and Pierce of Black Sun Productions, Jon Whitney of Brainwashed, Ben S., Claus Laufenburg, Danny McKernan, Andrew Lahman, Phil Barrington, Danny Hyde, Stefan Beiersmann, Terv Terran, and anyone else who ever contributed any informative remark to the Coil Facebook groups for helping me to construct this list. Additional thanks to Greg Reason for helping correct errors in the site contents. Not to mention, a BIG and hearty thank you to anyone who ever recorded a Coil concert in any form! AMT – amateur video, taken by an audience member, usually poorer quality (these recordings may be used on the EDIT sections, but have surfaced separately and stand on their own). 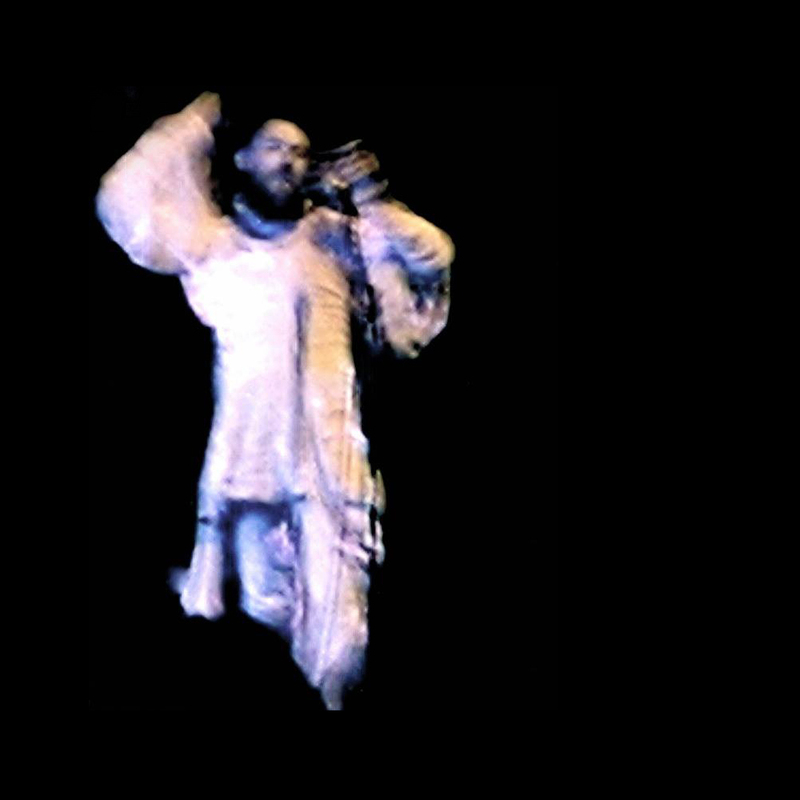 PRO – professionally shot video, but not included on Colour Sound Oblivion or surfaced separately. EDIT – professional edit using one or multiple camera angles, amateur or professional; each edit will denote how many cameras were used to make it and whether the cameras were recorded by amateurs or professionals. The “Quality” section regards the video quality with the video sources, not the sound quality. I feel it’s a little more difficult to judge video quality, and to me, the most important thing in any given circumstance is the sound, but nevertheless, most video sources have bad sound on their own, unless edited/synced with AUDs or SBDs. In the cases of EDITs, I’ll judge based on the best quality video source used for the rating. “M” means master. “M0” denotes a digital transfer straight from the master tape, so “M1” is a first-generation copy, “M2” is a second-generation copy, and so on. Every official release is at least an M1 or M2, if not even more, because often the recordings went through some processing (track indexing, EQ’ing, mastering, mixing in the case of multitracks, etc.) before being put on a CD or DVD, then a rip of those CDs and DVDs results in another generation. Regarding Colour Sound Oblivion, it’s unknown what generations the tapes he used were in. Back before digital transfers became the norm, Coil would make tape copies. Don’t know how many master tapes Peter had access to in order to make the best possible digital transfers, which could then be edited as he saw fit. Fans/bootleggers also made bootleg CDs out of their tape masters, which would then be passed around, ripped, and made into more CDs in an ongoing process. Sharing digital audio straight from the masters unfortunately did not catch on for the longest time, so the lineage of most of the audio recordings in this listing remains unclear unless otherwise stated. It is generally agreed upon that if a recording does not have a known lineage, it is lossy. Most digital audio files circulating are MP3, anyway. Some recordings will have a letter denoting them, i.e. “#1a” and “#1b.” The extra listing will detail a remaster, alternate version/master, or rebroadcast of the same recording. 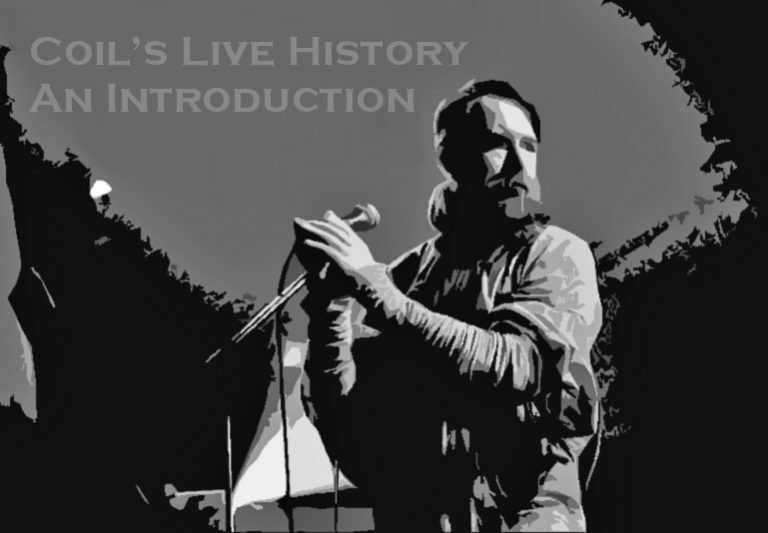 I am also a collector of images of Coil performing live, but did not include them all on this site for a couple of reasons (ie. for variety purposes and credit/watermark issues). Thighpaulsandra – the inspiration for Coil to play live from 1999 in the first place. Ivan Pavlov – “loyal assistant, translator, and rather scary bodyguard”. Sabine Waltz – Coil’s long-time booker. Andy Ray – Coil’s sound mixer/tour manager. Tim Sutherland – Coil’s sound mixer. David Cabaret – Coil’s costume designer for every live Coil phase except the “Black Antlers” phase. Ian Johnstone – John’s dresses during ATP and “Black Antlers” and Peter and Thighpaulsandra’s curtain outfits. Seb Shelton – manager of Thighpaulsandra, whom John first contacted in order to meet him. Paul Smith – enquirer to the Royal Festival Hall and Barcelona’s Sonar Festival who found out both venues would jump at the chance to have Coil play live at them, which helped kick start Coil’s interest in playing live again.